Derek Dyer may be best known locally as the founder of the nonprofit Utah Arts Alliance or as the creator of the Guiness World Record-holding “World’s Largest Disco Ball.” But he has captured almost as much attention for his photographic work, going back to the 1990s. His work can be so entertaining and such captivating eye candy that it can seem like feathery fluff, obscuring the more profound implications he’s trying to impart. In an artistic landscape where rough-hewn “art brut” and “outsider art” have a lot of hipster cred, his technical finesse can make his work appear facile, too easily achieved—but that’s a facade. Glitter People, produced between 2005-2010, is one of several series Dyer has used to explore the human body—including Glow People with phosphorescent paint and Earth People caked with mud and clay, rocks and flowers. 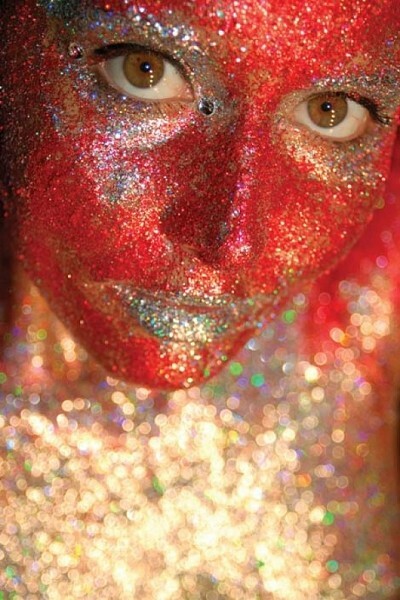 But the Glitter People, wearing body paint and glitter, have a special place in his works: “The concept behind this series is to visually represent that we all have a light or sparkle inside of us. Some call it a soul or life force. As every individual is different, so the Glitter People are different, with varying colors and textures representing the unique beauty and energy that lies inside everyone,” Dyer explains. Exhibiting his work at the Sorensen Unity Center prompts the observation that, underneath whatever glitter or glitz adorns us, we as human beings are all the same.